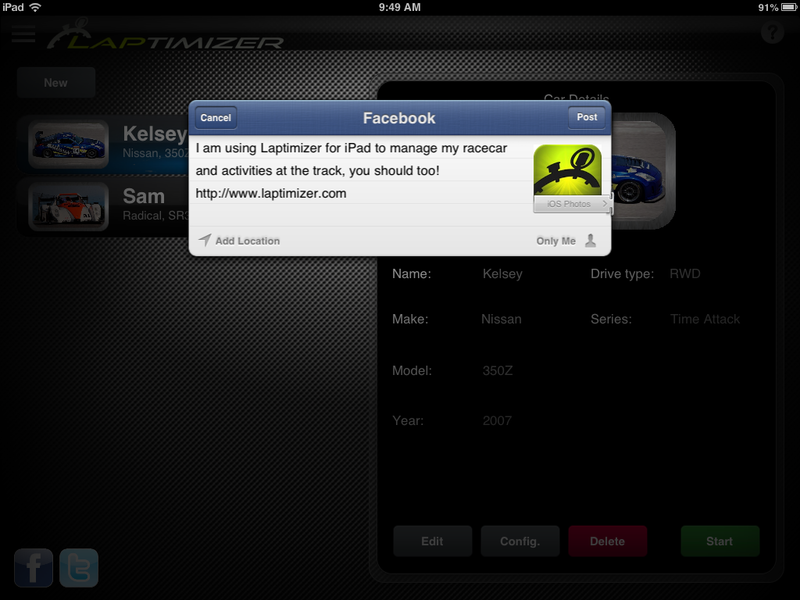 Laptimizer, designed to make your life at the racetrack easy! 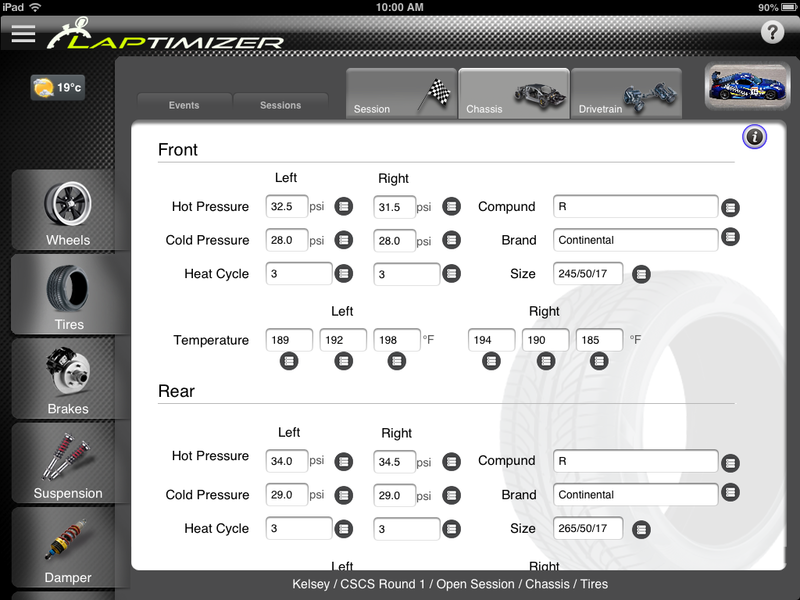 No more hand written setup sheets, no more binders and loose papers; all of your unique racecar setup information is now at your finger tips through the iPad®. There are a number of tools, apps and full fledged solutions, such as data acquisition systems and OBDII readers, to manage the output of a vehicle’s performance, however there are very few or even none that manage the input of its settings. Laptimizer has been designed from the ground up to manage the input of all of your racecar data so that hand written notes become a thing of the past and are replaced with a modern sleek infrastructure for inputting and managing your racecar data. 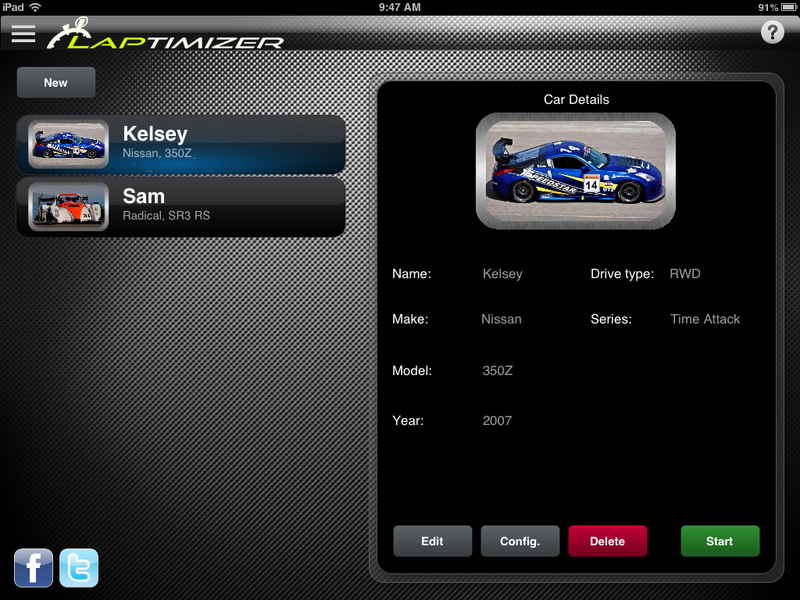 Add multiple racecars to Laptimizer. Define the items which are relevant for your car, including engine configuration, series spec and even its own name with a picture. 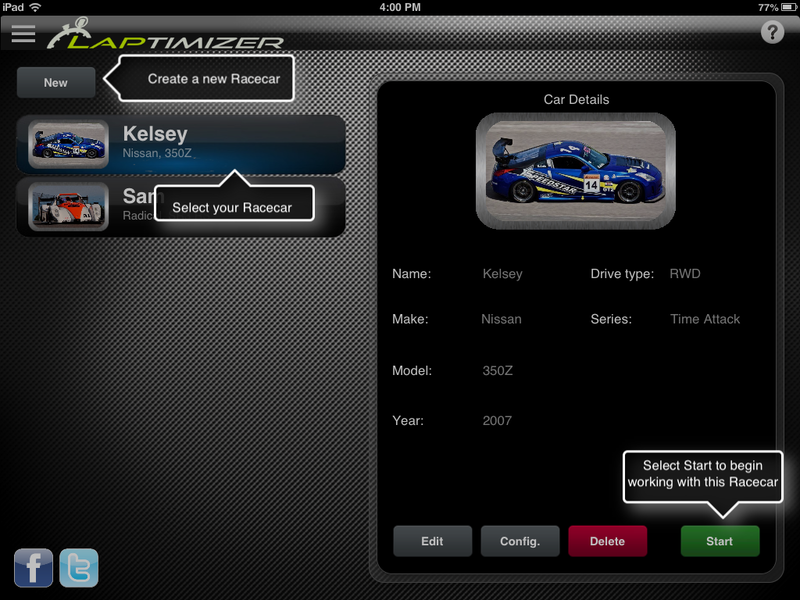 Customize the setup parameters that are unique to your car. From regular non adjustable suspension to fully adjustable coilovers with high and low speed bump and rebound settings, we manage it all. 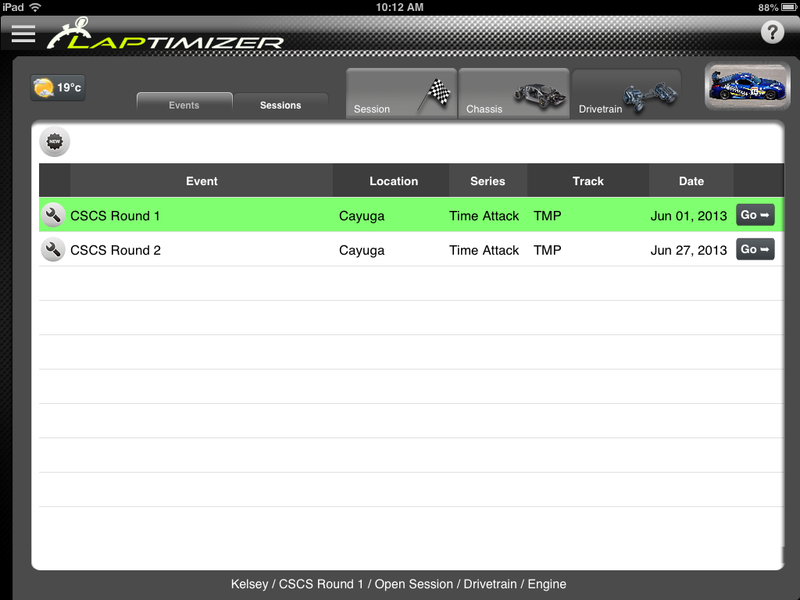 Create all the events for your series or add them on the go. Specify the Series, Event Name, Track, Location and Date for the event. This level of detail allows for easy sorting and retrieval of data later on. After creating an event you can then manage as many sessions for that event as necessary. 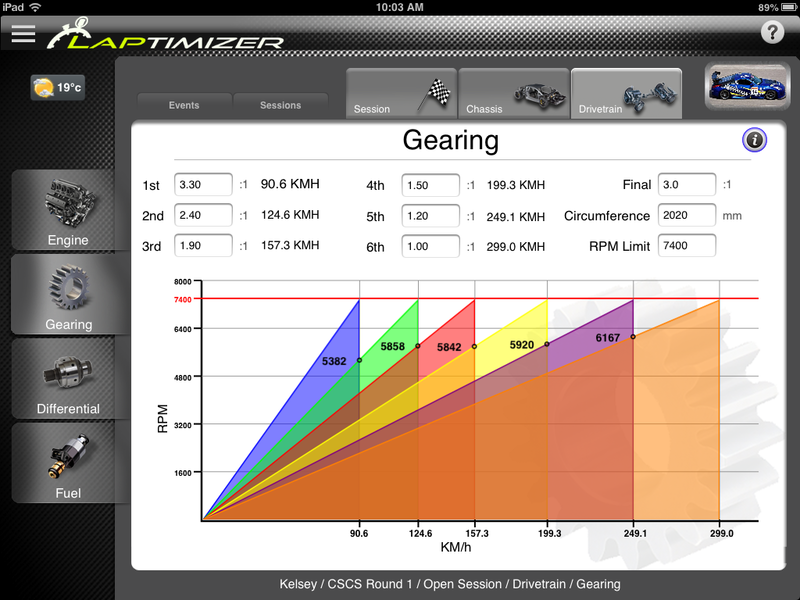 Start with practice, modify the setup for qualifying and then optimize the final race tune. With the 3G/4G and geo tracking abilities of the iPad, local weather information and hourly forecasts are available directly within the app. 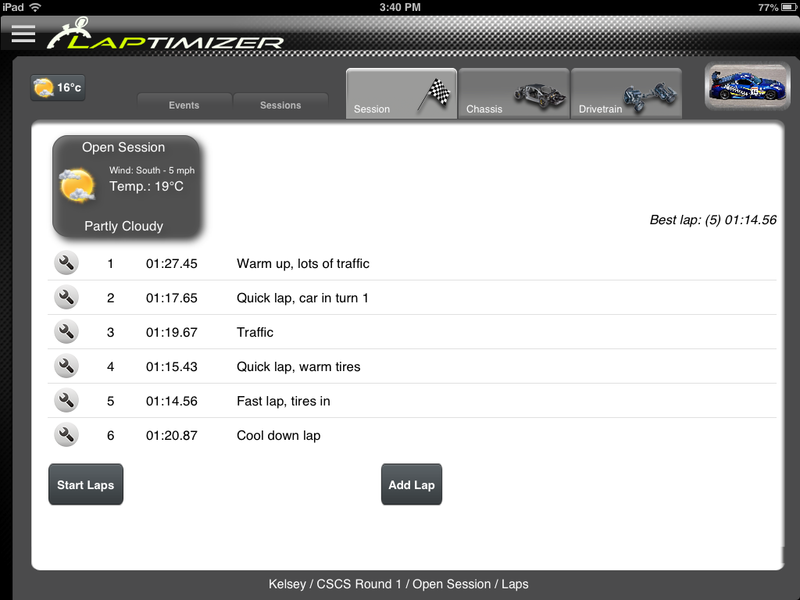 Also, add track temperature and other information which will be stored along with the session for comparison purposes later on. 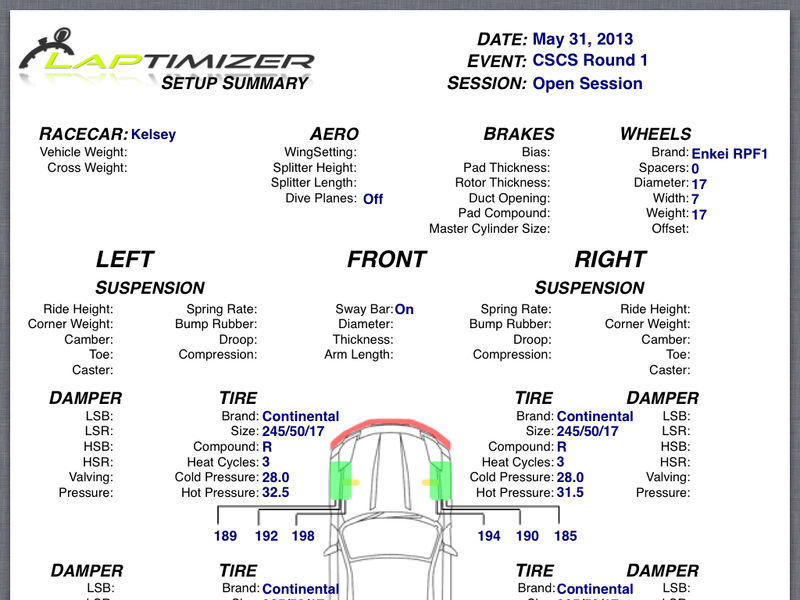 After building a library of event and session setup data for your car, you can recall historical information from a previous event and compare it to your current setup. The result is the ability to confidently dial in a competitive setup for your car from the moment you arrive at the track. 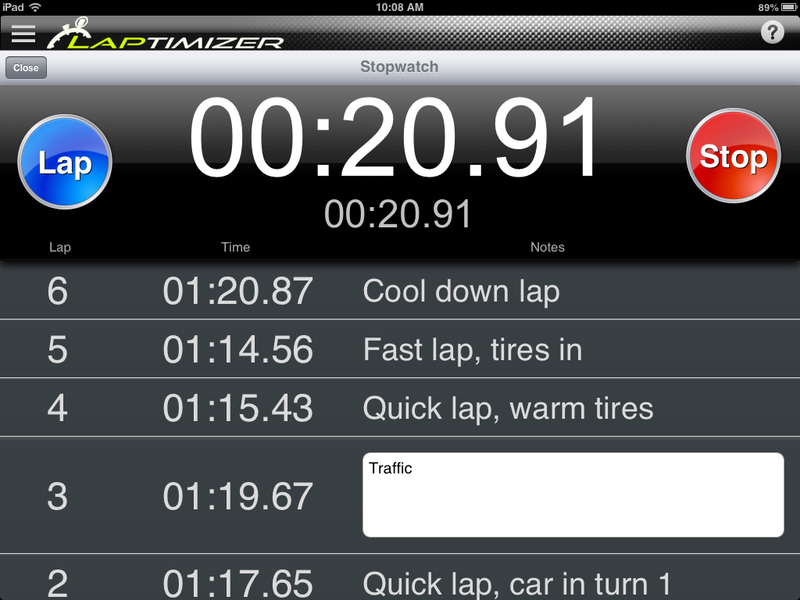 Laptimizer includes a lap timer which will store your lap times per session along with your setup data. 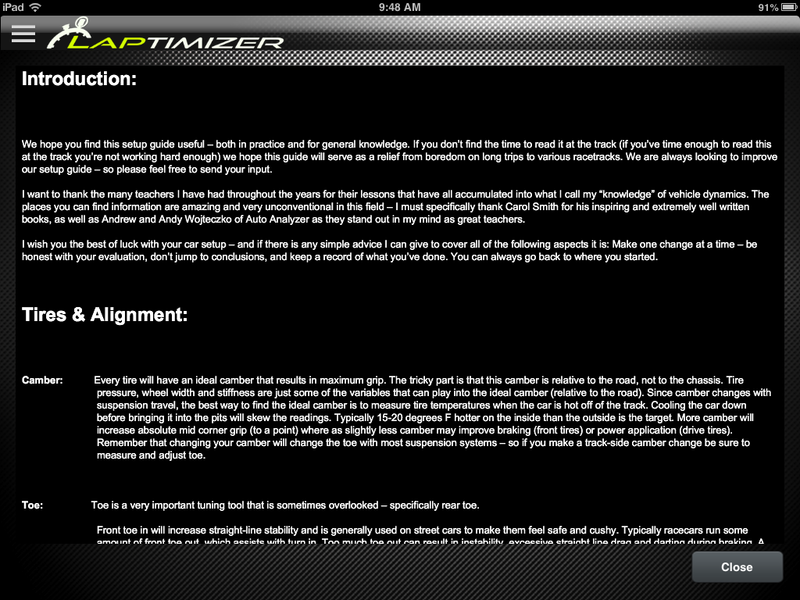 Additional notes can be added to compliment the lap time and setup data which can turn anyone into a well prepared race engineer. Laptimizer has a built in setup guide to help you along the way. 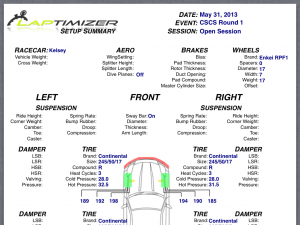 Whether you are new to racecar setup or a doctorate on vehicle dynamics, this setup guide will be a helpful reminder on how to extract those last few tenths out of your car. Produce Reports on the Fly! Laptimizer: Reports on the fly! Laptimizer allows you to produce session reports on the fly at any point throughout your event which captures ALL of the data you have entered and embeds it into a clean and simply presented PDF report which can be viewed, emailed or printed on the fly. Share the excitement on Social Media! 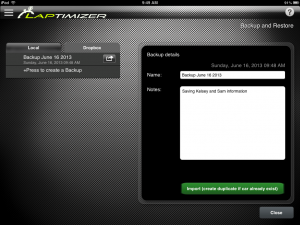 Share directly to Facebook and Twitter from within Laptimizer. Why not let everyone know how awesome it is! Because your data is so important to you, we decided you need a way to back it up in case the inevitable happens. There is a simple built in feature to backup your data either to your email or your Dropbox account and easily restore it if necessary. Help for when you need it! Laptimizer also has a built in help feature. The top right corner of the screen has an extremely useful ? button. Use it and the app will guide you in the desired direction. If worst comes to worse, email us from the About Page witin the app! Laptimizer is brought to you by a group of dedicated motorsport enthusiasts and a group of dedicated iOS developers who after much collaboration have brought the world of mobile applications to the racetrack nearest you! 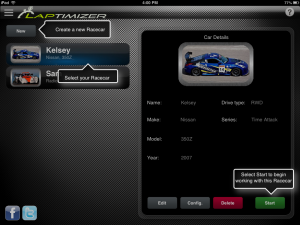 Laptimizer for iPad is an optimized mobile application which has been developed from the ground up to ensure a quick and efficient user experience to make certain you get the most out of your track day, race weekend, or series championship. 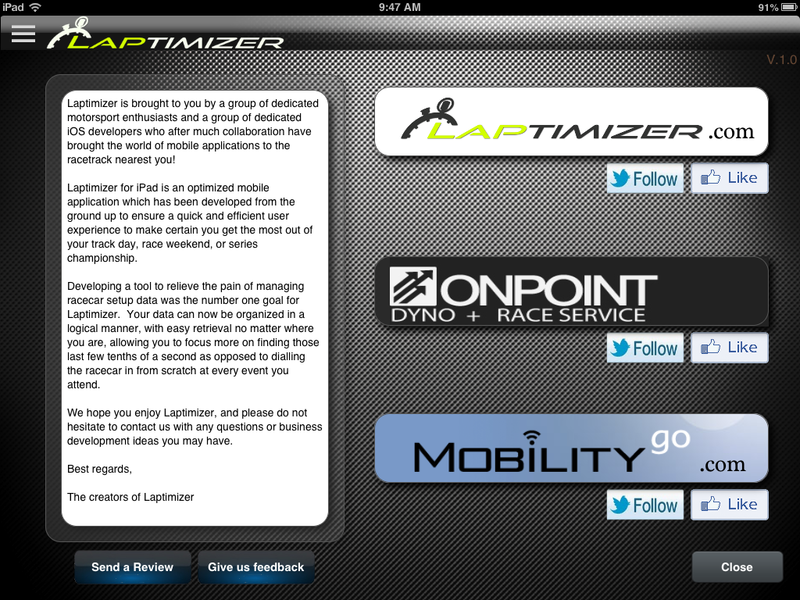 Developing a tool to relieve the pain of managing racecar setup data was the number one goal for Laptimizer. Your data can now be organized in a logical manner, with easy retrieval no matter where you are, allowing you to focus more on finding those last few tenths of a second as opposed to dialling the racecar in from scratch at every event you attend. We hope you enjoy Laptimizer, and please do not hesitate to contact us with any questions or business development ideas you may have.